The earliest forms of tie-dye were not actually from derived from American culture. Though much of the fabric evidence of early tie-dyeing has disintegrated, there are other pieces of evidence suggesting that tie-dye existed thousands of years prior to America’s adaptation. History suggests that the earliest form of tie-dye originated in India as Bandhani and dyed mummy cloths suggest that the practice had traveled to Egypt back in 1000 B.C. Tie-dye also has a long history in Asia, originating in Japan as Shibori and traveling to China around 400 B.C. Africa, too participated in different styles of tie-dye early on, and eventually the practices were introduced in Peru. The type of tie-dye most of us picture was not actually possible until 1956 when fiber reactive dye was introduced. In the 1960s the American hippies used tie-dye as a symbol of their free-spiritedness. 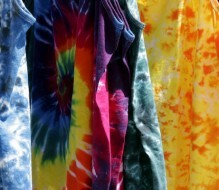 As your resource for custom t-shirts and artwork, we have an appreciation for the rich history of tie-dye. If you or your organization needs custom t-shirts designed and printed for an upcoming event, contact the staff at Tip Tops in Eustis, Florida.